You are here: Home / Voices Of Dash Nation / Dash: The Future Internet of Money? We’ve all heard the term “Internet Of Money” thrown around. A lot of different projects, centralized or decentralized, feel like they can lay claim to the title of IoM. The centralized projects can be excluded right away from the running, as they fail in a crucial aspect of internet ideology. Centralized services are not permissionless, and to lay claim to this lofty title, you can not have any failure by not having all of the properties of money, and not having all of the properties of the internet. So that leaves decentralized projects such as cryptocurrencies like Bitcoin and Dash. In this article I will demonstrate how the cryptocurrency Dash fulfills or has a plan to fulfill all of the qualities of the internet and of money, whereas Bitcoin fails in several key areas. Dash, the leading candidate to be the Internet of Money. First, let me introduce Dash. Dash is a cryptocurrency which is based on and makes several improvements to Bitcoin (the first cryptocurrency)’s open source code. It has all of the properties of Bitcoin (decentralized, open ledger, security through proof of work, easy transfer of value) but it improves on the areas that Bitcoin is lacking to lay claim to the IoM. Dash was launched in 2014, and since then has gained popularity and market cap. Its founder, Evan Duffield, is a brilliant man in the fields of finance and technology, so it was fitting that he would combine the best of both worlds to create the only real candidate to be the “Internet Of Money”. In the cryptocurrency space, there still is a lot of people who believe that Bitcoin is the one and only currency to rule them all. Competing projects such as Dash and Ethereum are routinely ridiculed, even though they introduce concepts that Bitcoin can’t or will take years to do so, for reasons I will explain later. 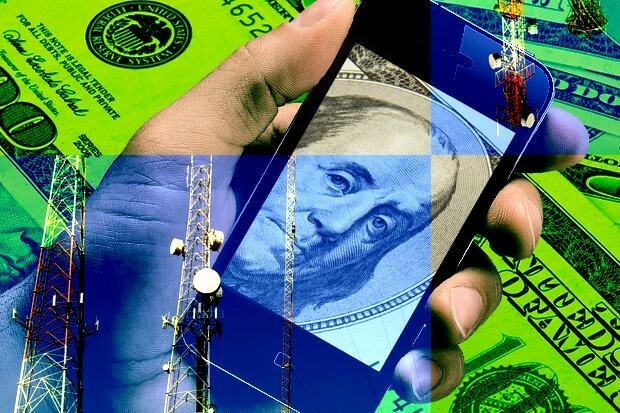 It will be quite a shock to them to realize that the network effect can be broken if something comes along that is significantly better and has features that will enable it to be used by the general public. So why is Dash the best candidate right now to be the Internet of Money? As you can see from the graphic above taken from this site, you need to have quite a few features to be considered money. Bitcoin and Dash are the same in that they are a medium of exchange, they are a unit of account, and they are a store of value. But further down, we see a subset of qualities that money must be. Bitcoin has most of these as well, with a couple of exceptions. 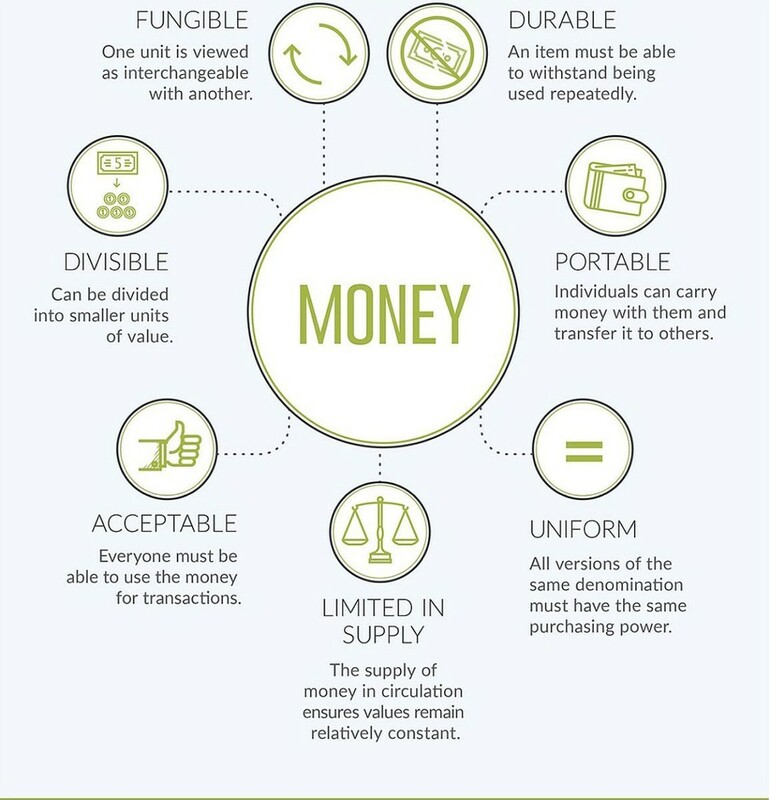 To be money, a currency must be fungible and uniform. This is not the case with Bitcoin, as its open ledger is on display for anyone to see at any time. This leads to problems of companies offering services to track people’s Bitcoins and see if they have been used in any nefarious dealings. In a vacuum, that would not be a bad thing, but as we have seen in the past, this can lead to censorship of people’s assets. Bitcoin community members have introduced centralized services to try and make your transactions more opaque, but as we’ve seen before, once you introduce centralization, you automatically are disqualified from being the IoM. Dash’s privacy software Darksend, which is renamed PrivateSend in Dash V12.1. Dash does not suffer from this problem as it has introduced a decentralized technology to protect your privacy, and therefore the fungibility of your currency. Dash does this by utilizing a second tier masternode system. Nodes can be established by anyone with a collateral of 1000 DASH, and once established perform all of Dash’s open source functions. One of these functions is Darksend (soon to be renamed PrivateSend) which is a system of pre-mixing Dash in-wallet before use. Dash are sent through multiple rounds of mixing with other users, without ever leaving your wallet. The result is a stash of untraceable Dash which makes them fungible and uniform, resistant to censorship. Bitcoin fails in a few key areas in it’s quest to be the IoM. Another area that Dash separates itself monetarily from Bitcoin is in the speed of transfer. Bitcoin uses proof of work to confirm transactions. Its algorithm is designed to have transactions confirm in 10 minute intervals, and to be fully confirmed after 6 confirmations. 60 minutes is a long time to wait for any retail situation, no one wants to pay for something and then wait around an hour to see if it went through. But if the merchant doesn’t wait, they risk being the victim of adouble-spend, meaning that someone could send the same Bitcoins to another address before your transactions confirm. Dash has lightning quick confirming transactions with InstantX, to be renamed InstantSend in Dash V12.1. 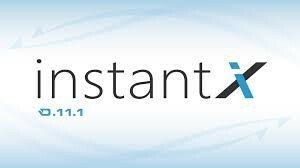 Dash saves the day here again with a system known as InstantX (to be renamed InstantSend) . Remember the decentralized second tier masternode network? Another one of its open sourced services is making transactions instantaneous. When a user selects InstantSend in the Dash wallet, a quorum of masternodes, decided by Dash’s proof of work algorithm, locks your transactions and signals to the network that no other transactions with those inputs may be permitted. This effectively means that as soon as you hit send, the Dash are transferred from buyer to seller, and both may go on about their day. The transaction is then considered “fully confirmed” after one proof of work confirmation, on the Dash network this is roughly 2.5 minutes. However, this is only a formality as the transaction, once verified by InstantX, cannot be double spent. Dash is designed to be liquid money, and change hands fast. The IoM requires ease of use and decentralized scalability. However, even if Dash is the closest thing right now to the IoM, there still is a lot of work to do to get there. Dash faces a number of challenges. Its market cap is a fraction of Bitcoin’s and has a huge but not impossible network effect to overcome, it has to create a self-sustaining governance and funding system that will outlive its founders, and it has to make this Internet Of Money easier to use for outsiders. Dash has a very ambitious plan to take the strong base it’s created, improve on it, and propel itself into the future using decentralized funding and governance. How can this be achieved? Once again, the second tier masternode network proves its usefulness with yet another protocol-level functionality. The masternode operators, who have a large stake in the future of this money, get in exchange for their 1000 DASH collateral a say in the direction of Dash, and by doing so get a share of the block reward. Acting similar to shareholders or parliamentarians, they evaluate proposals and vote on each one. If an idea makes sense for Dash, it will be supported. If it’s frivolous or not well detailed, it will not garner much support. 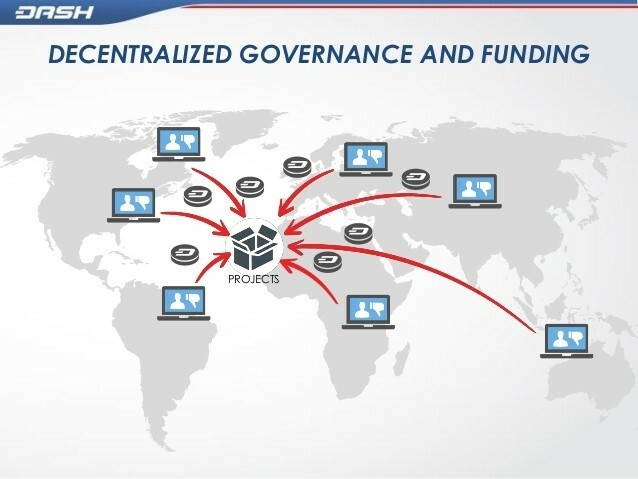 This system, known as Decentralized Governance By Blockchain, or DGBB, enables Dash to make key decisions in a timely manner to improve the Dash protocol. 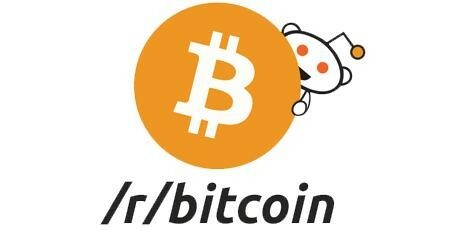 Bitcoin relies on social media and websites for governance. By contrast, Dash’s competitor, the initial cryptocurrency Bitcoin, has no such way of deciding on anything. It relies on social media, message boards and semi-centralized miners to make decisions. Just to make a simple decision of whether or not to raise the Bitcoin blocksize to allow more transactions has taken over a year. Dash made this decision in 24 hours. So, Dash has the potential to make multiple decisions while Bitcoin struggles with one. Going forward, that will be a huge advantage for Dash as it continues to take bites out of Bitcoin’s market cap. Bitcoin gets funding from and cedes influence to centralized entities such as Blockstream and MIT. The DGBB also allows for decentralized funding, with Dash coming straight from the blockchain to pay for improvements and proposals. This means that Dash, as a decentralized entity, will not have to answer to any outside influences to decide the future of digital money. Sadly, Bitcoin fails at this aspect as well, as it relies on benevolent donors, or centralized organizations such as Blockstream or MIT. And as Dash acceptance and marketcap grow, the more projects and improvements can be approved, leading to more acceptance and marketcap in a positive feedback loop. Once again, all of these innovations are brought to you by Dash, the future Internet Of Money. Now, how will Dash tackle the mass adoption issue? For the Dash team, this means making the Internet Of Money easier to use for people. Making it easier to use would mean giving people easy to understand addresses and streamlined wallet experiences. For this we turn to Dash’s latest innovation Evolution. 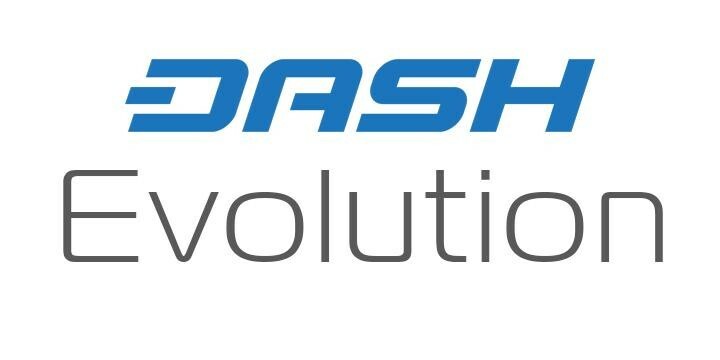 Evolution will make Dash easier to use than any other cryptocurrency. Evolution has ambitious goals of bringing cryptocurrency to the masses via easy to understand usernames, and a decentralized API which will allow access to your “account” (wallet) from anywhere just like people access a centralized website. A user simply signs up for a Dash Evolution account, creates a username and password, and is good to go. In the Evolution account, you can create links to other users or “friends” that you can exchange Dash with. This account, backed by the decentralized and secure Dash network, can be accessed from anywhere via the DAPI which is hosted on the second tier mastenode network as well. In addition, this model will see the masternodes host the blockchain so the average person won’t have to worry about downloading it. As mentioned before, the masternodes recieve block rewards for performing all of these open-sourced services, so the blockchain will have room to grow and scale through expensive high-capacity computing. These innovations in Evolution are game-changers in cryptocurrency usability, and should give Dash the push it needs to be the de facto Internet Of Money. Bitcoin is finding ways to scale also, but the time it takes to make a decision in that ecosystem will lead to fighting over the best solution for a long while. Bitcoin as is will have difficulty making important decisions. 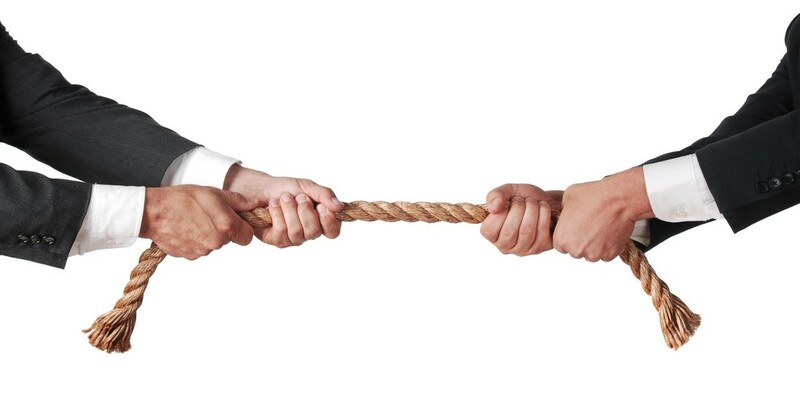 So, due to Dash’s superior current technology, and the means to innovate faster and more efficiently than its competitors, Dash is the only project today that has a clear path to becoming the undisputed IoM. I am a sportsman, however, and I do wish Bitcoin luck with its quest as well. To find out more about Dash and Evolution and how we are on track to become the IoM, click here. Want to get involved in building the Internet of Money? 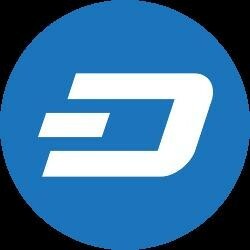 Please join the conversation at DashTalk.org or on the Public Dash Slack Channel.